(CN) – A newly discovered nearby – in cosmic terms – exoplanet could support life, scientists report Wednesday. 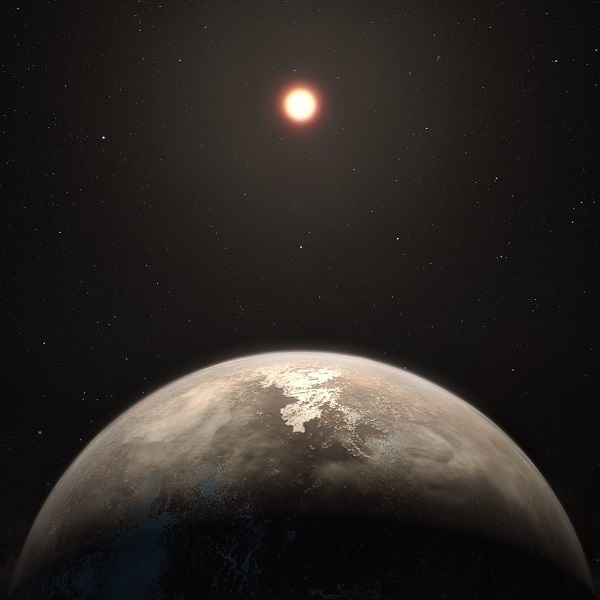 Named Ross 128 b, the exoplanet orbits a “quiet” red dwarf star every 9.9 days and is similar in size – and possibly surface temperature – to Earth. These factors make the exoplanet, which was discovered using the European Southern Observatory’s High Accuracy Radial-velocity Planet Searcher, or HARPS, an ideal candidate in the search for life elsewhere in the cosmos, according to a study published in the journal Astronomy and Astrophysics. “This discovery is based on more than a decade of HARPS intensive monitoring together with state-of-the-art data reduction and analysis techniques. Only HARPS has demonstrated such a precision and it remains the best planet hunter of its kind, 15 years after it began operations,” said co-author Nicola Astudillo-Defru, a researcher at the University of Geneva in Switzerland. Using data from HARPS, the scientists determined that Ross 128 b orbits Ross 128 about 20 times closer than Earth revolves around the sun. However, the exoplanet receives only 1.38 times more radiation than our planet, as Ross 128 has just over half the surface temperature of the sun. Due to these factors, the team estimates that Ross 128 b’s equilibrium temperature – a theoretical temperature that a planet would be at if it were heated only by its host star – of between -76 to 68 degrees Fahrenheit. While the scientists consider Ross 128 b to be a temperate planet, it is unclear whether it lies outside, inside, or on the edge of the habitable zone within which a planetary surface can support liquid water. With astronomers discovering new temperate exoplanets more regularly, the next step will be examining the composition and chemistry of their atmosphere in greater detail. Such efforts will be aided greatly by the ESO’s Extremely Large Telescope (ELT). “New facilities at ESO will first play a critical role in building the census of Earth-mass planets amenable to characterization,” said lead author Xavier Bonfils, a researcher at the Institute of Planetology and Astrophysics in Grenoble, France. “In particular, NIRPS, the infrared arm of HARPS, will boost our efficiency in observing red dwarfs, which emit most of their radiation in the infrared. Ross 128 b is unique in that its red dwarf, Ross 128, does not eject flares of deadly radiation – another factor that indicates the exoplanet could house life. The red dwarf is currently 11 light-years from Earth, or about 65 trillion miles, but it is expected to become our closest stellar neighbor within just 79,000 years – a blink of the eye in cosmic terms. Currently, Proxima b holds the crown as the closest exoplanet to Earth at 25 trillion miles away. Its star, Proxima Centauri, occasionally flares and bathes the exoplanet with ultraviolet and X-ray radiation, making habitability unlikely.